A study of ancient DNA revealed that European people have genes of three ancestral human populations and not two, as it used to be thought. CONICET professionals contributed to the examination. The research aimed to improve the knowledge on the ancestry of current Europeans. For this reason, scientists sequenced complete genomes of a ~7,000-year-old farmer from Germany and eight ~8,000-year-old hunter-gatherers from Luxembourg and Sweden (Loschbour-Motala). These data were analysed together with other early and contemporary genomes of 2.345 people from 203 current populations and indicated that migrations played a leading role in the introduction of agriculture. 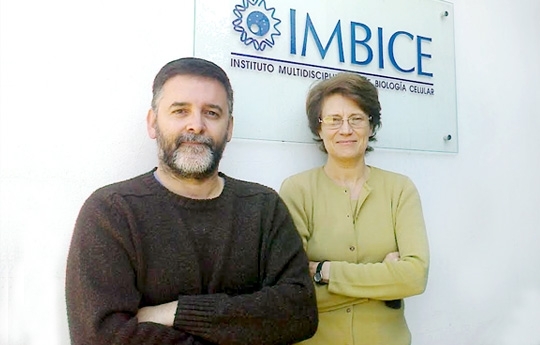 The results were provided by a multidisciplinary study made by 120 co-authors of 88 institutions of 35 countries led by researchers of the University of Tübingen (Germany) and Harvard Medical School (USA), with the participation of Graciela Bailliet and Claudio Bravi, CONICET independent researchers at the Instituto Multidisciplinario de Biología Celular -IMBICE, CONICET-CIC-[ Multidisciplinary Institute of Cell Biology] among others. The paper was published in Nature magazine, in England. “We collaborated with the research in providing our samples of present-day Argentine populations that have a significant aboriginal composition”, Bailliet comments, and adds “the main issue is to talk about the European population, what are the genetic aspects; how agriculture was introduced in Europe, and what complexities led to current populations”. Besides, Bravi remarks the importance of the contribution because “it helps to understand the origin of the populations from a methodological point of view”. Then, he affirms that “being able to access the genetic information directly from ancient human remains opens up a new way to research the origins of human populations”. After interpreting the information, the scientists concluded that current Europeans derive from at least three different populations: west European hunter-gatherers (WHG), ancient north Eurasian (ANE), and early European farmers (EEF). Through these models, the study revealed that early European farmers had 44 per cent of ancestry from Eurasian basal lineages who were the first to be separated from other non-African lineages. From these early samples, the ancient mitochondrial DNA was characterized: Stuttgart belonged to the DNA haplogroup T2, typical of Neolithic Europeans, and Loschbour and all Motala individuals have the U5 or U2 haplogroups, typical of pre-Neolithic Europeans. Stuttgart was a female, whereas Loschbour and five Motala individuals were male and belong to Y-chromosome haplogroup I, showing that this was the common haplogroup in pre-agricultural Europeans from the north. The researchers estimated the proportion of ancestral genetic components in present-day Europeans: the ones from the north have more hunter-gatherer ancestry, while the Europeans from the south have first farmer’s ancestry. Nevertheless, initially, the farmers themselves had some hunter-gatherers ancestry. The analysis of ancient genomes provides information about the colour of the hair or eyes of those people, for instance. It was stated that some of the hunter-gatherers probably had blue eyes and darker skin while the first farmers used to have fairer skin and brown eyes. Graciela Bailliet. Independent researcher. IMBICE, CONICET-CIC. Claudio Bravi. Independent researcher. IMBICE, CONICET-CIC.